With work underway converting Charlie's Car Wash to the Full Circle Theatre, we ran a reduced season for 2009-2010, with only 4 productions happening. Even with only 4 shows on the boards and 90% of our attention on the renovations of the car wash, we managed to do some interesting work! With a temporary move into quarters at the Myriad Centre for the Arts in Perth, we chose another simply staged play to keep ourselves active. Four people watch a play that is performed in our imaginations. Their comments and reactions provide our entertainment. It's almost like going to real theatre! 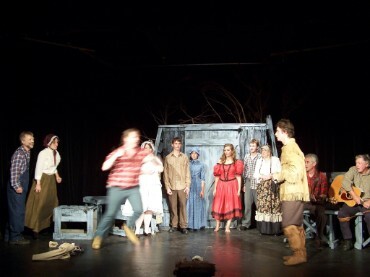 Below: Rachel Needham, Sydney Jacklin and the cast. A new musical adaptation of Charles Dickens' other Christmas story. The Chimes is engaging, exciting and entertaining, as well as seriously scary in some places! A real challenge for our cast, as well as a technical tour de force. Presented at the Myriad Centre for the Arts. 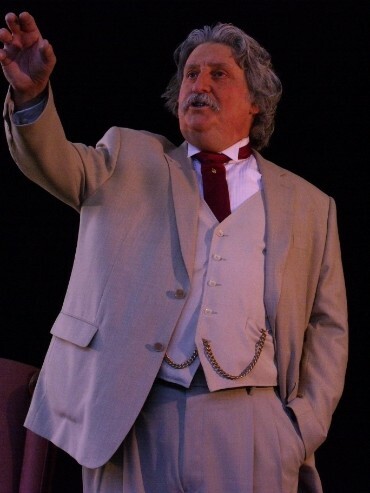 David Jacklin as Mark Twain. Digging back into the deep past, we revived a one-man show that David first performed 33 years before, when he was 21! Mark Twain's Patent Scrapbook is a collection of Twain's writings and ramblings, brought back to the stage in lively fashion in observance of the 100th anniversary of Twain's death. 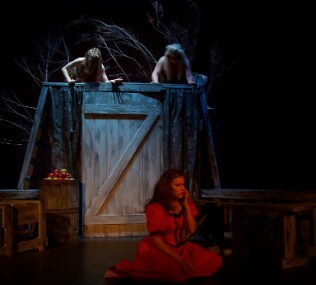 Presented in Perth at the P&DCI auditorium and later in Smiths Falls at the new Station Theatre. Below: Marvin Hudgens plans to "whop" John the Witch Boy. It doesn't work out the way he expected. Most of the cast in the shot. Oh, what a show! Dark, mysterious, moving, dramatic, comic, musical, balletic, mythical and poetic, it came to the stage in grand style at the Station Theatre in Smiths Falls. A show that was called "just crazy good" by someone on the street. Above:stripping out the old lower office. Upper Right: the old upper office, walls removed, leaving only the beloved washroom fixtures that the women loved to use. 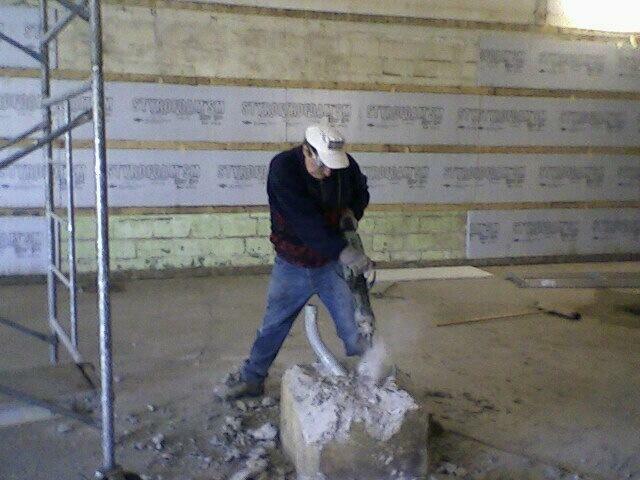 Lower Right: using a jackhammer to remove concrete installations in the theatre side! That's dead centre of the front row of seats. Note the "insulated" walls. Below: Volunteers scrubbing theatre seats in the beautiful basement. This was the men's shower when the place was a work-out gym! At the end of June 2010, we received our building permit to begin work on the conversion of the car wash. What a job! Stripped to the bare concrete walls and floors, we then proceeded to re-build from the walls in.